New Delhi: Tipu Sultan has become a hotly debated topic on social media after Karnataka's tableau for Sunday's Republic Day parade glorified the 18th century ruler with a complex legacy. Moments after a giant bust of Tipu Sultan brandishing a sword glided down Rajpath on Sunday, with the commentary describing him as a hero who died fighting the British, a war of words erupted on Twitter. Many critics argued on the micro-blogging site that it was wrong to pay tribute to a "tyrant" responsible for killing thousands. "If we accept a Tipu Sultan float, there is absolutely no reason not to have floats of British monarchs and viceroys," tweeted Barbarian Indian. "Numerous accounts of Tipu Sultan killing, torturing, converting Hindus, destroying temples. Also of his fight against the British. Dark, complex (sic)," posted Abhijit Majumdar. 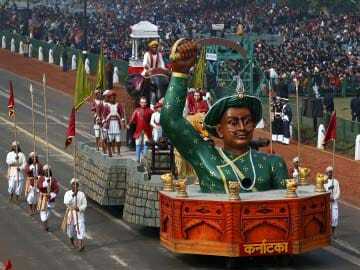 Others like Nakul Shenoy wrote, "Happy to see Tipu Sultan being featured in the Karnataka tableau for the Republic Parade. Politics has ensured we have mostly forgotten him." Within hours, the battle of tweets turned into a history lesson with people on both sides of the argument posting links to essays and articles on the ruler known as the "Tiger of Mysore." Tipu Sultan was last in the news in 2004, when liquor baron Vijay Mallya bought his sword in an auction for Rs.1.5 crore. His life was also the subject of a TV show in 1990. He is described in some sites as a scholar, soldier, poet and polyglot who scored important victories against British rulers but whose treatment of captured non-Muslim subjects and British prisoners of war was controversial. As Tipu Sultan continued to trend on Monday, one tweet observed that "People are debating Tipu sultan & his legacy like he lives in race course road in Bangalore today and drives a Bentley." In the cacophony of fiery tweets, Sameera Gawandi posted, "Let history b history #Tipu sultan y the fight now?"